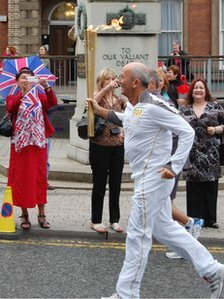 As Tony Pulis carried the olympic torch through the City Centre Hanley, Stoke – on – Trent on it’s way towards Cobridge, Burslem and Middleport a photographer captures an apt picture. I wonder if it’s a reflection on Port Vale’s last few seasons? Welcome to our third newsletter/ product update. 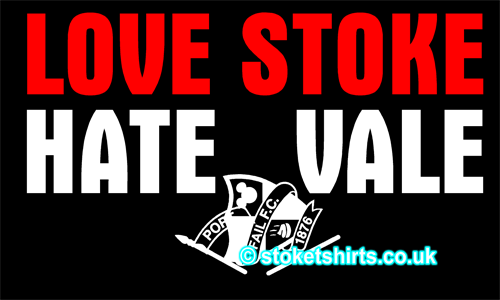 We have been busy working on a new category called Love Stoke Hate …… that has 7 new designs. 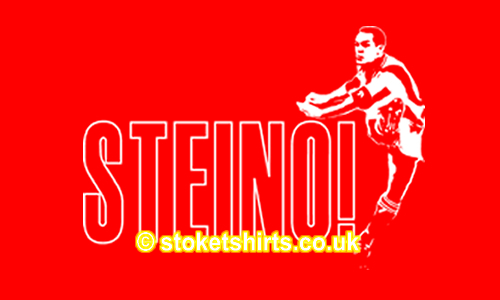 We also have 4 new designs based on players (The Great in our title) we haven’t covered yet. 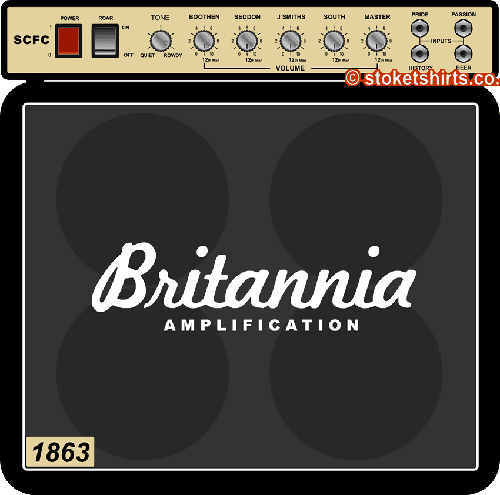 One of these is a legend on an international scale – the first true “international football superstar.” There are also 3 designs that haven’t yet featured in a newsletter but have been available for a while plus another anti Vale for good measure. Have a read of our other news at the foot of the page too! It was Chrissie Hynde of The Pretenders who wrote the above line, but why pretend? I totally disagree. I believe it’s a very thick line, a line as wide as the River Trent itself. We all Love to Hate a team and we have covered more than a handful of “the despised” in this newsletter. The “Love and Peace, Goodwill to all men” message of Christmas is over and done with for another year, let’s get back to full on hate! It’s part of our passion that makes the Bearpit Great. Why do we hate teams? The reasons are wide and varied. 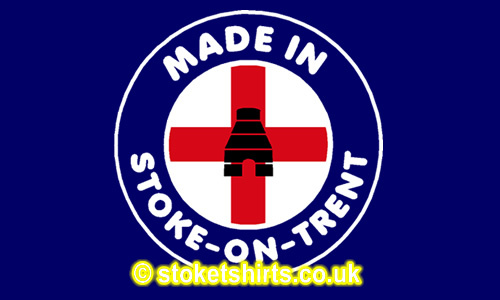 With Stoke & Vale both back where they belong does the hatred whither? I don’t think so. Man U, does anyone really need an explanation why we hate them? 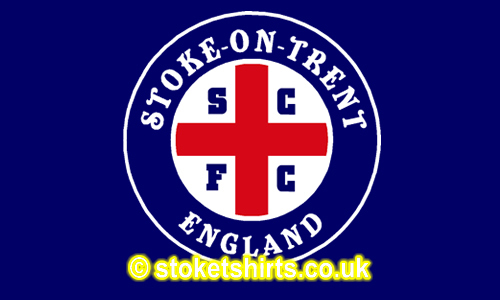 The other three major gloryhunter attractors are also given their own design along with a collective “LOVE STOKE – HATE GLORYHUNTERS” design. Wear these shirts with pride to show your Love of Stoke and the club you despise! 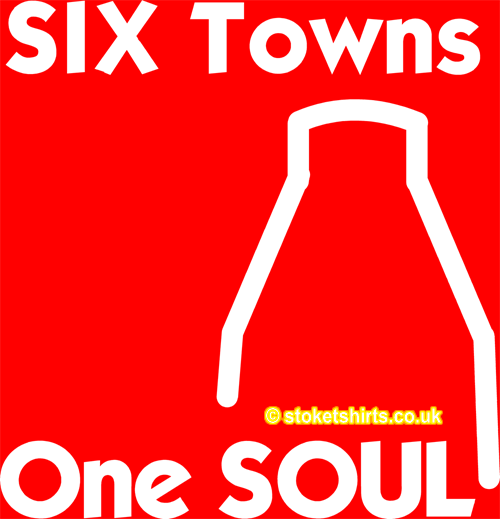 One for the South Staffordshire Stokies completes the set with the Dingles having a design that includes two silver bullets! We Support Our Local Team. A lineup of the Gloryhunters dream Nightmare! Whinging Wenger, FA Cup Semi Finals, IceCream Seller, Highbury Library, Diving Eduardo, Alleged Bungs, Gloryhunting supporters. The Gunner’s Cannon has brewers droop! AbromaRICH trying to buy success, Cash no Class, FatFrank, Diving Drogba, Alleged Illegal approaches, Gloryhunting supporters. Fat Spanish Waiter, 8 Nil, Gerrard punches like a girl, Missing Wheels, Diving Forwards, Gerrard Justice?, Gloryhunting supporters. The Liver Bird crys again! The Red Devil Forks Himself! Vagrants, The Un Washed, Foyle, Porter, Grew, Walker, Billy Bellend, Charlie Machin’s European Dream (drug test please! ), Puddles at The Wembley of the North, Illegal Market, The dog had it’s day and we never heard the last of it! The True Vale badge snaps and displays it’s true values. The Fat Controller mad Jezzer, Yam Yam Yam Yam, Orange n black, Dingles. The Wolf is finished with a couple of silver bullets! If I was to the you that T stands for The and V stands for Vale, can you guess what the F stands for? 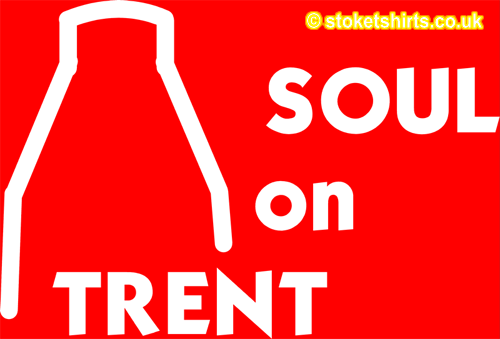 Answers followed by the word off, on a postcard please to Port Vale FC, Hamil Road, Burslem, Stoke – on – Trent. Ooh Andy Andy, Andy Andy Andy Andy Wilkinson. The most improved player since Stoke have been in the Premier League. 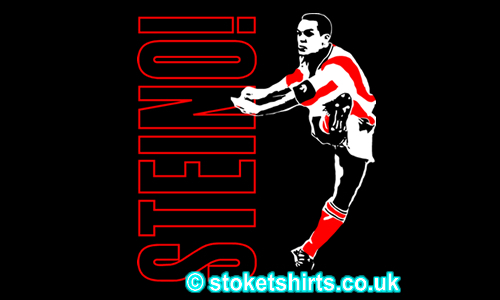 A few forwards have felt his sharpness recently so how better to celebrate his brilliance than a pack of blades bearing his name. Thomas Løvendahl Sørensen born on the12th. 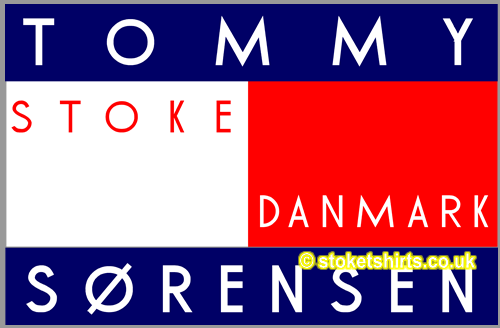 of June 1976 in Fredericia, Denmark, better known to us Stokies as Ooohh, Tommy, Tommy, Tommy, Tommy, Tommy, Tommy Sorensen. His fantastic record of penalty saves for Stoke City this season as seen him become a real fans favourite and his presence between the sticks has made us one of the meanest defensive sides in the Premier League. The design we have used also recognises his success on an international level, where he will be defending the Danish goalmouth during the 2010 World Cup in South Africa. He has moved on from being Peter Schmeichel’s understudy to owning the position outright. Dean Whitehead – apparently the “dury’s jury’s still out” but we appreciate what Dean brings to the team and honour him with a design based on another “marmite” character, Ian Dury (well his Blockheads any way!). When we signed Dean I wrote that he could become another Steve Foley, a player that player’s love because he puts in the hard yards and lets them get on with their game, Foley was that type of player in Lou Macari’s successful Stoke City team, loved by the players but not cherished by the supporters. Never could this be a truer statement than when referring to the very first player to make a shirt number his own. The No. 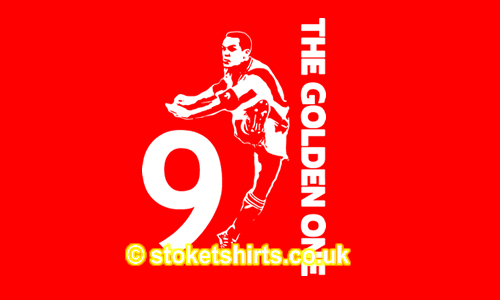 7 worn on his back wasn’t required to identify Sir Stanley Matthews, he let his skill do the talking. 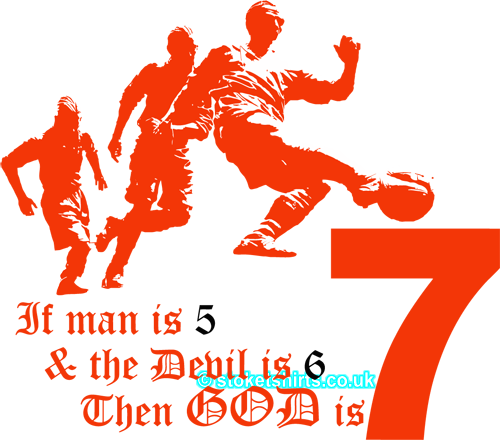 “If Man is 5, then the devil is 6, then GOD is 7” and added the image of the world’s finest football statue. Who else could have a FA Cup Final named after him despite the same team’s centre forward (Stan Mortensen) getting a hat trick. A representation of you – one of our great supporters. Boothen, Seddon, J Smiths and South. n.b. The selection isn’t the traditional 1 to 10 but one more than the spinal tap 11 at 12th. Man. 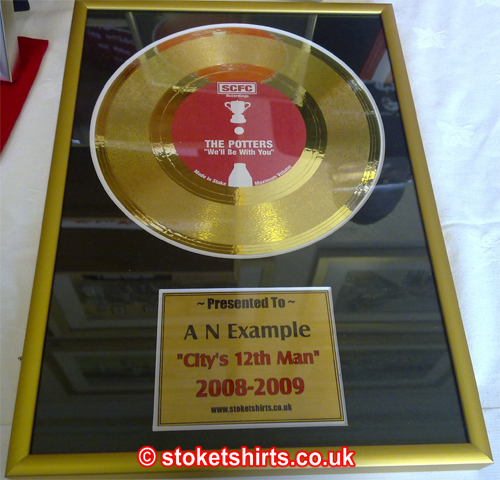 Our inspiration for this design was this video at the end of the season awards. 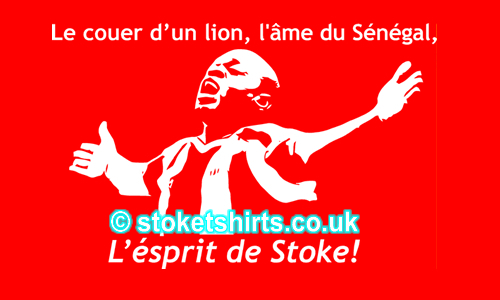 The motto – “Vis unita fortior” and it’s Translation – “United Strength is Stronger” are both included on the shirt. 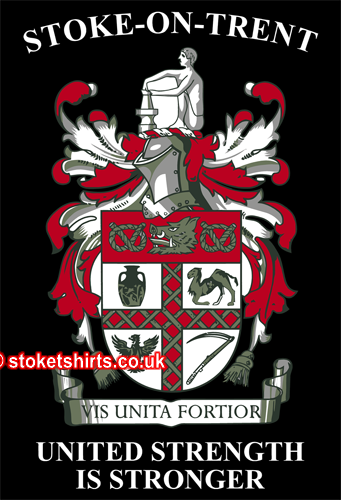 A representation of the six towns all bought together in 1925 to form The City of Stoke – on – Trent, although this crest was recognised on the 20th. March 1912 where the six towns united into a single County Borough. So what else have we been upto? 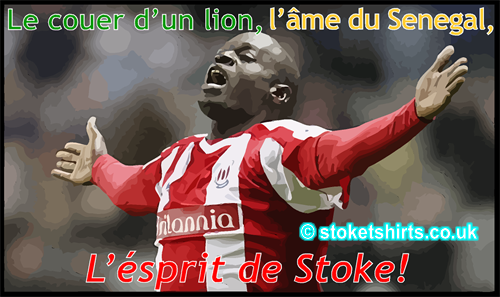 We have sponsored Abdoulaye Faye’s away kit this season – read the story of our day out at the Brit to meet the great man himself here – Abdy and Santa We also produced some Stoketshirts.co.uk Abdoulaye Faye masks that were modelled by a group of Stokies on Sky Sports 1 Saturday Morning Football Show – Soccer AM. We were part of an exhibition that featured on BBC Midlands Today – See the Clip here (Midlands Today & Artbay) that features our great artist Potter 63 aka Darren Smallwood, Ian Dyer aka The Boothen End Bard and the Stoke City Legend Alan Hudson. 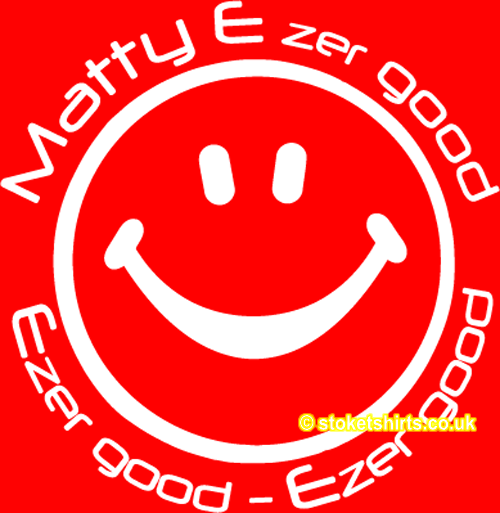 Our shirts have the compliment of being called “Designer T Shirts” paid by the presenter Dan Pallett in his commentary. We have still to confirm which design we will be using to make our next limited edition mug. For those of you that attended the Artbay exhibition you may have seen our wallet and passport holder samples. 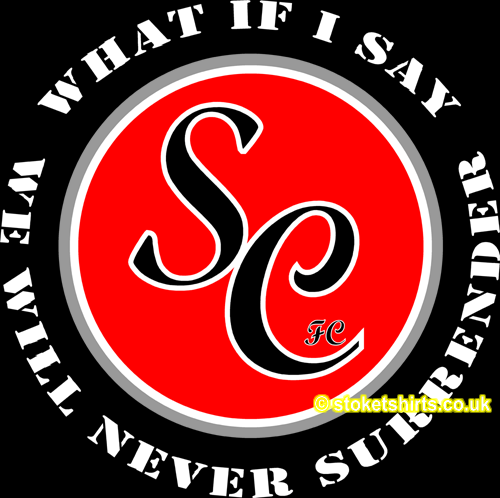 These will be available in the coming months as well as some new ideas re. clothing and accessories. We are also in the process of setting up a new business which we aim to be a “one stop shop for all printing requirements”. 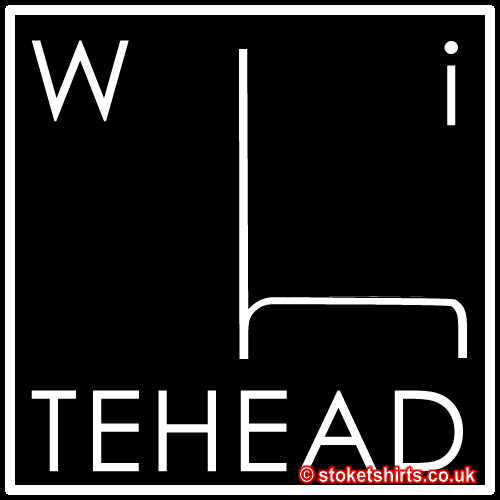 Whether it be Clothing including T shirts, Polo Shirts, Stag & Hen Wear, Workwear or Stationery and Promotional Merchandise. We also have facilities to produce and fit Vehicle Graphics and Signage including Banners, Shop, Exhibition, Information and Safety Signage. 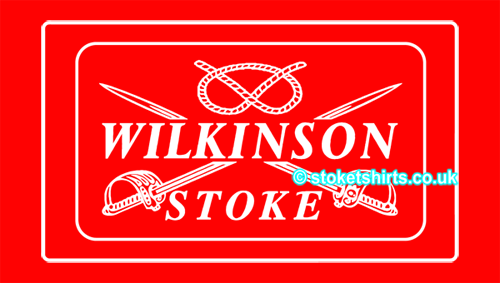 If you are interested in any of the above and would like a competitive quotation, then email info@stoketshirts.co.uk and we will get back to you. Our new designs – click the picture to take you into the store. 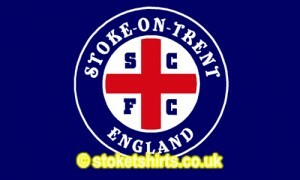 (C) Copyright 2009 stoketshirts.co.uk All rights reserved.